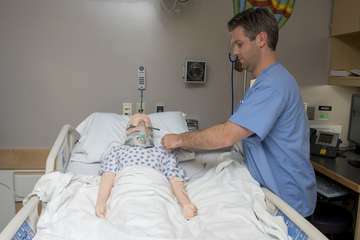 In the first year of the pediatric longitudinal simulation curriculum, PGY1 residents are placed in simulation cases that reflect situations in which they would realistically find themselves, including being the first responder in the ED and on the wards. The cases are focused on communication and clinical reasoning and represent things we believe PGY1 residents should be able to do independently by the end of the year. PGY1 residents, in pairs, progress through 6 level-specific simulated cases over the course of the academic year for the purposes of education and formative evaluations. At the end of the academic year, each PGY1 progresses through 6 additional cases individually, back-to-back, without debriefing for the purposes of summative evaluation.